The Western Digital drives were already tested in RAID arrays, and today we will use their results for comparison. Earlier we saw that Seagate's performed badly in distributed arrays. Let's have a look at the Seagate Barracuda 7200.7 ST3160023AS. In the separate tests the Seagate drive had a kind of problem in writing, though it generally performed better than the Parallel ATA model. Today we are testing a couple of such drives with firmware version 3.05. The Iwill IS150 controller allows making RAID0 arrays with the chunk size of 4, 15, 32, 64 and 128K. Since the results obtained with different array parameters are similar, here we show only those for the 16KB chunk. Unexpectedly, the Seagate looks better than the WD at reading at the beginning of the array. The read speed of the single Barracuda 7200.7 is lower - have a look at the diagram to see why. 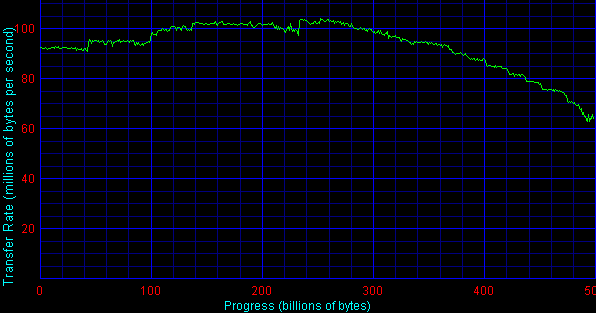 The WD reaches the maximum linear read speed not at the beginning of the array - hence such results. The array built on the WD2500JD has the access time comparable to the single disc, while the array built on the Seagate Barracuda 7200.7 has it lower by 0.5 ms. As a result, the Barracuda has a good advantage. The WD2500JD performs better in the High-End Disk WinMark but loses in the Business Disk WinMark probably because of the poor realization of writing algorithms of the Barracuda 7200.7. Here are the scores for the arrays with the chunk size of 4, 32 and 128K. The scores are almost similar, the WD drives take the lead only at the maximum loads. In the Web-Server pattern the Seagate drives look better especially at the average loads. The Workstation pattern demonstrates parity. In the Database pattern the WD looks better especially at high loads. To find out the reason let's look at the patterns' specs, in particular, percentage of Write. The higher the percentage, the worse the Seagate Barracudas perform. The array built on the Seagate Barracuda 7200.7 looks better at random reading at the average load, and falls behind at random writing. The situation is similar to the single disc. These diagrams show once again that the Seagate Barracuda 7200.7 has problems in writing algorithms. The array built on the WD2500JD copes better with reading of small chunks, but the Seagate array has the higher maximum read speed. It looks logical considering that it starts reading from the beginning of the array. The WD looks superior again in case of small chunks (except 1K ones) and goes on a par in case of larger chunks. The tests show that the array of two Seagate Barracuda 7200.7 ST3160023AS looks quite good compared to the array based on two WD2500JD in reading especilly at the average loads (16-64 simultaneous requests). 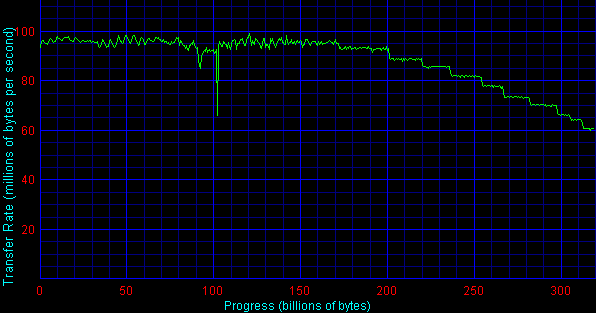 At the same time, the writing algorithms do not let the Seagate array perform well when the write requests outweigh.